Recording a macro is, surprisingly, much simpler than adding a new button. Select “Add Activity”, press “Next” a few times, then begin recording commands from any device. When needed, delays of 0.2, 0.5 1.0 or 2.0 seconds can be added between steps; a short delay is inserted by default. Macro creation is unexpectedly advanced. Steps added so far can be tested at any time, plus it’s even possible to pause the macro if you’re uncertain about how something works and would prefer to double-check beforehand. There’s practically no limit to the number of steps in a macro. After everything has been added, an activity-flavored icon is assigned and a customized name can be entered. Both devices and activities are shown on the Home screen in [nearly] the order of creation. Although their arrangement can’t be changed, the Nevo does separate device and activity icons into different sections on the wheel – devices on one half and activities on the other. Macros aren’t merely assigned to the home panel. Each and every LCD-based device button can also hold an activity, though macros can only reference other device buttons and can’t store new commands or jump to another device. Macros cannot have their recorded commands edited – an entirely new sequence of steps would need to be entered. Although the Home screen features both devices and activities side by side, there’s no way to assign a macro to a device. For example, each time I select the “VCR” device I’d like to automatically transmit the discrete power and input commands that go along with it. I could duplicate that functionality with a VCR activity, but that would involve two icons encumbering the wheel instead of one. Another macro-related idea is the Favorites section, which is composed of pages of color television network logos that, once pressed, play back a short macro that enters that channel number into your satellite, DVR, television, VCR, or cable box. As one of the three main remote sections, UEI is placing heavy emphasis here. By default the Nevo comes with four pages of eight icons each. 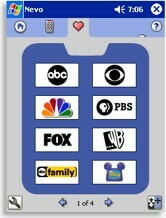 More favorite channel icons can be added, but additional icons aren’t included in the software and must be downloaded from the website or manually created. Icons are device dependant, meaning they will only reference the device with which they were originally created, but you aren’t limited to controlling a single device in the whole Favorites section. Indeed, one could use this area for practically anything. Because of that, it can take a while to record the macros needed for each station number – nothing is automated. Icons are rearranged the same way as device buttons, from point “A” to unused point “B”, so inserting an icon into the middle of the list is a rather difficult proposition. In contrast to a PDA’s typically “single user” nature, the Nevo is one of the first mass-market remotes to advertise an on-board multi-user/multi-room architecture. This means that configurations can be set up for various family members and each user can control devices in multiple environments without having everything clutter up the home screen at once.